Last week I took two of my visiting guests (the third is Thai and was visiting his family instead) around Bangkok to see the sights. Instead of doing the usual things, we spent a good portion of the day exploring the city using different, and often less-touristy, modes of transportation. The idea occurred to me a few weeks ago. One of the guests is an aviation enthusiast, so I extrapolated that he might also be interested in other forms of transportation. When I’ve previously used other ways to get around the city, I find myself seeing Bangkok through an entirely different light. The modes of transport used could be varied and there were at least three – bus, taxi, and motorcycle taxi – that we did not try. In the future, I will have to refine this itinerary, but here are the notes from this time. 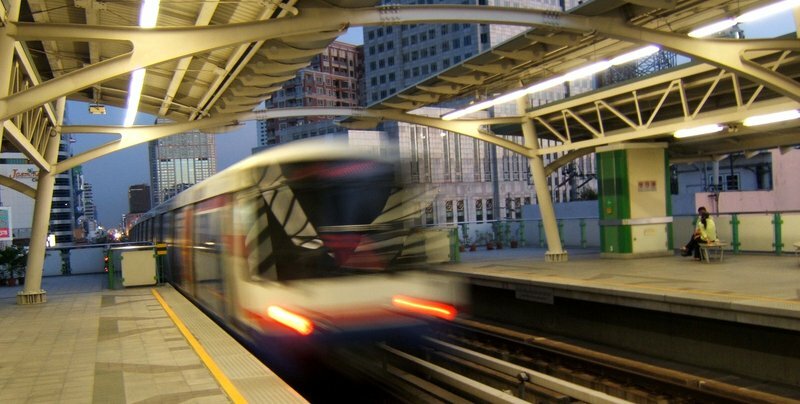 Walking from their hotel to the nearby Asoke-Sukhumvit intersection, my guests and I descended into Bangkok’s five-year old subway for a ten-minute ride to the Hualamphong train station. The subway is clean and modern and the insides of the trains as well as the platform areas are surprisingly free of advertising. A short walk through an underground passage took us to the front entrance of the Hualamphong Railway Station. Trip price, approximately 20 baht each. 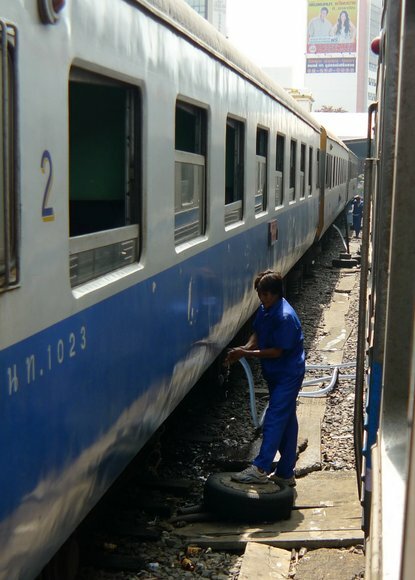 Our timing was perfect as there was just enough time to buy our 8-baht tickets and get to the platform before the four-car diesel locomotive pulled out of this 1930’s-era station and began the thirty-minute ride to the eastern suburbs of the city. We could have disembarked at an earlier station and shaved some time off our route, but these open-window, unairconditioned carriages (which are older than me) and their passengers provide interesting people watching. My entry about the steam engines the State Railways pulls out for special occasions. Also operated by the State Railways, this elevated electric train runs along the same right-of-way as the diesel train, so we retraced our steps. 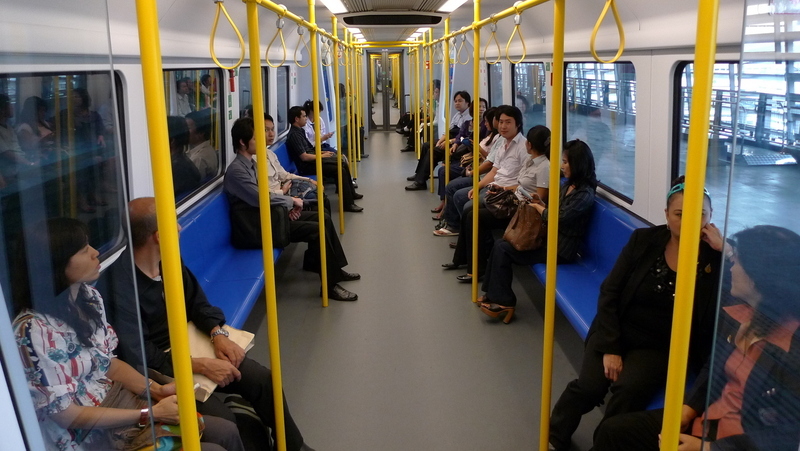 The City Line and the Airport Express share the same track and we disembarked at the brand-new “in-city terminal” where one day passengers will be able to check in for flights, deposit their baggage, and take the 15-minute express train to Suvarnabhumi Airport. 15 baht each but will increase after January 1 to a distance-based pricing scheme. Link to my review of the Airport Express. 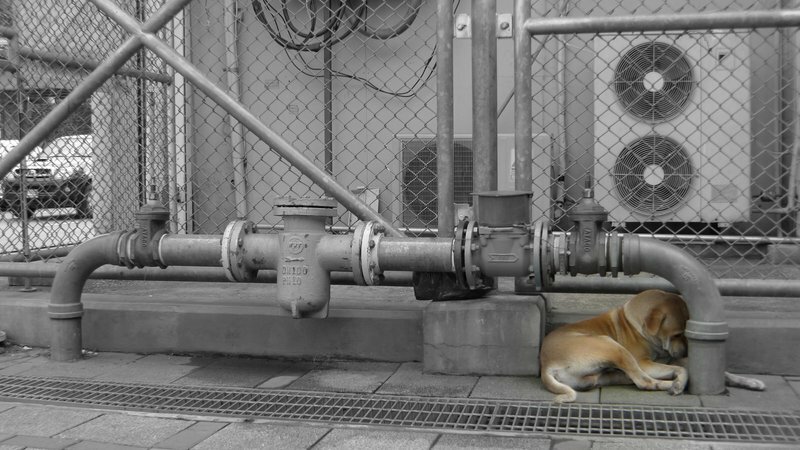 A dog taking a nap outside the Petchaburi MRT Station, near the Asoke Pier. A short walk from Makkasan Station is the San Saeb Canal, a major east-west aquatic artery in this “Venice of the East” and the only one that has regular boat service. The water is murky and the boat engines are very loud, but it is an adventure and provides a view of yet another, much poorer, facet of life in the Big Mango. The end of the line is at the foot of the Golden Mount, the only hill in the city. 11 baht each. 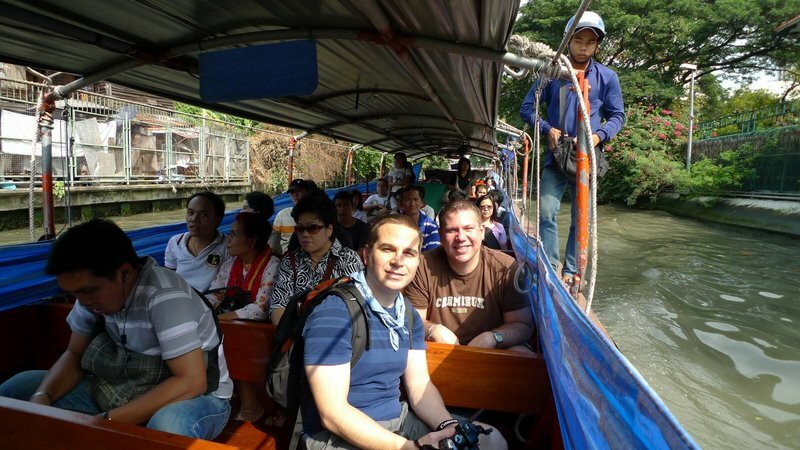 Craig and Matt and a few dozen other passengers enjoy their ride on the murky waters of the San Saeb Canal. The boats whiz under various bridges, some so low that the canopied top of the boat must be lowered. Which explains why the conductors/deck hands wear helmets and are very alert of their surroundings. We negotiated with a tuk-tuk driver to take us to a riverside restaurant located just outside the gates of Tammasat University. 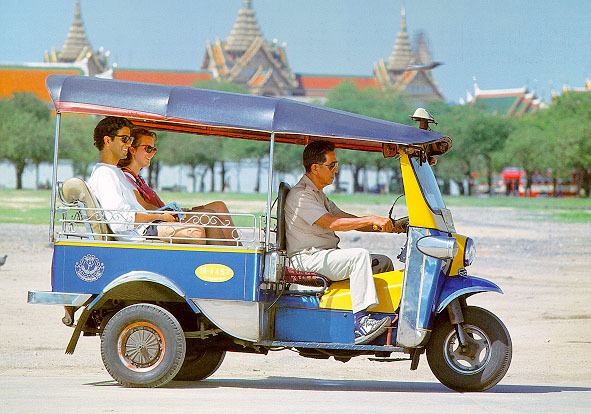 Tuk-tuks are three-wheeled auto-rickshaws that serve as transportation in many parts of town, so named because of the sound of their engines. These are actually pretty dangerous and for the price you pay, a taxi offers greater comfort (air conditioning!) and safety (seatbelts!). We could have taken the tuk-tuk all the way to the Grand Palace but I was hungry so lunch first. 60 baht total, so 20 baht each. 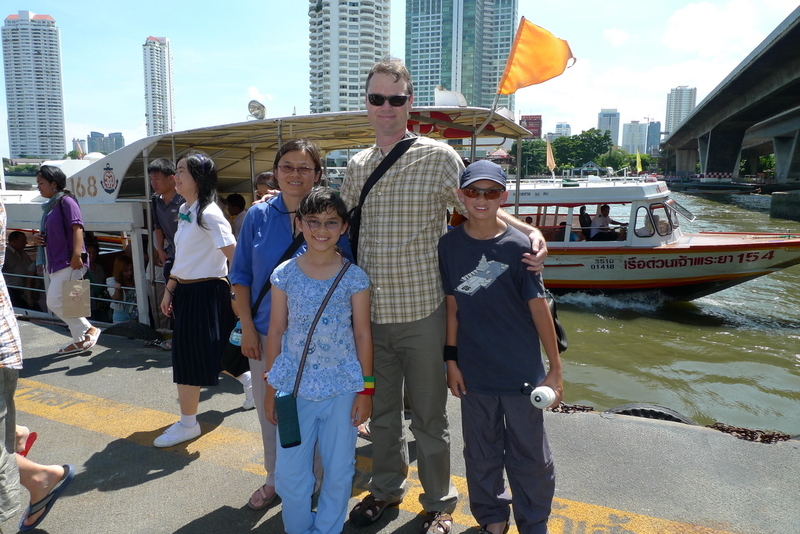 Previous guests (not Craig and Matt) after disembarking from the Chao Phraya River Taxi. After lunch we were too late to see the Grand Palace (it closes at 3:30 – don’t believe anyone who tells you it is closed before that time) so we walked to Wat Po, the Temple of the Reclining Buddha. I’ll write about that in another entry but once we were finished, a bit after rush hour, we caught a river taxi service from the Thai Tian Pier right near the temple back to Sathorn Pier underneath the Taksin Bridge. Also 11 baht each. We concluded our journey by walking to the nearby BTS Skytrain station. The 10-year old BTS Skytrain is convenient and overcrowded. Thankfully, new four-car trains are entering the system soon and additional cars have been ordered for the three-car trains. From what I’ve read, BTS is also the hold-up in the efforts to create a common ticketing platform (a la Hong Kong’s Octopus card) between the three electric rail systems. Nonetheless, for about 30 baht we made our way back to the Asoke-Sukhumvit junction. 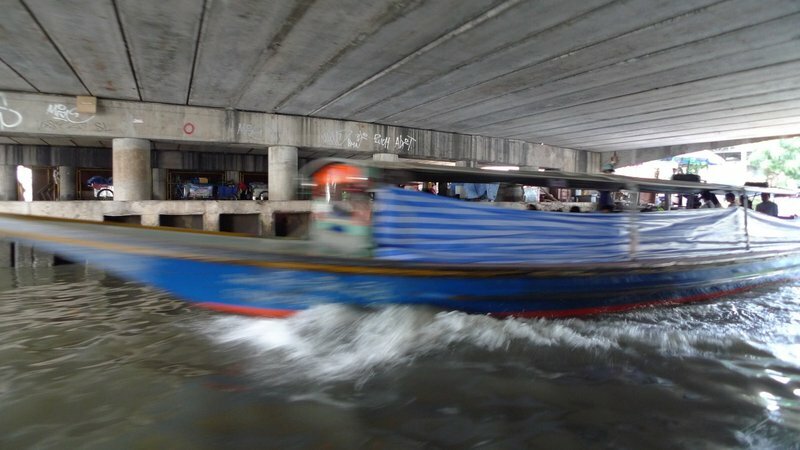 This entry was posted in Uncategorized and tagged Bangkok, boat, canal, Krungthep, Metro, MRT, River, San Saeb, Skytrain, subway, taxi, train, transit, transportation, travel, tuktuk by christao408. Bookmark the permalink. Very interesting tour! I’m not sure what the cost is (baht vs dollar) but I’m almost certain it was very very inexpensive! Good idea to start a tour like this one for future visitors! I enjoyed most by taking the river route, and ‘klongs’ or small river ways taking a glimpse of the local folks. ah you’re from bangkok too? i just moved here, live near the sukhumvit line … love the pictures! It’s amazing how different modes of transportation can give us different glimpses of an area. Great pictures!And I had the same question as someone else; what is the conversion rate for the currency? That’s a wonderful idea! Much better than using the same mean of transportation. Especially as a tourist. Lovely pics and very nice side notes. haha. Thank you for sharing! @murisopsis – @puella_sapiens216 – Sorry, I should have stated that. 30 baht = 1 dollar@CurryPuffy – The travel by boat is quite fun. The train ride also provides a look into the back doors of people’s lives. @girl_smileyy – Yes, I’ve lived here five years now. Welcome. @nov_way – You’re very welcome. Thanks for your comment. I love all the options. We do need some more mass transit here. Yike….thigns have changed…when we were there the Baht fluctuated between 12 and 22 baht to the dollar!!! Thank you for the tour. About the tuk-tuk, I don’ mind so much the “hair-raising” rides, but I don’t really enjoy the haggling over the fare. This is quite fascinating. Our new mayor wants to cancel the new light rail lines which have just started construction and expand the subway system (a lot more expensive). I like the old trains and would love to try the canal boats.btw – nice pic of the dog.